Every woman is a queen inside. 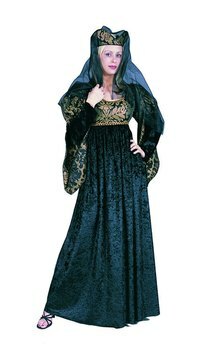 However, sometimes your inner queen may need to feel the need to show herself at a costume party, while answering the door at Halloween or while playing with your little princess. When the urge strikes, be ready with this quick and easy queen costume that takes under 30 minutes to make and can be worn over and over for tons of fun. Spray paint the shoes, spoon and headband gold. Do this outside away from the house to protect furniture and clothing. Cut two circles out of the poster board. These will become the top of your scepter, so they can be as big or small as you like. You can decorate them with rhinestones or leave them the color of the poster board. If you are a magical queen, then your scepter may double as a magic wand. Tie the ribbons around the wooden spoon. Use a big bunch of them with long tails to make the scepter more elegant. Your scepter will work even better than this diamond one for issuing royal decrees. Glue a poster board circle to either side of the wooden spoon. You will need to press the circles into place until the glue sets. Decorate the headband with the scarf and rhinestones. Glue the scarf to the bottom of the headband so that it flows behind you like a royal headdress, then cover the top of the band in rhinestones to show off the royal jewels. Put on the leggings, purple shirt and gold shoes. Leave the shirt hanging out over the leggings. Knot the second scarf around your waist. You can secure it with the large lapel pin for added royal flair. Put on your headband and your gold jewelry. You can place the headband over a pony tail or actually use it to hold your hair back. The gold jewelry is, of course, part of the royal treasure. Wave your scepter grandly as you give orders to your subjects. Now, you are ready to rule the kingdom!